Cats are ill tempered and mean at their worst, but even the most annoying problems have a remedy somewhere. 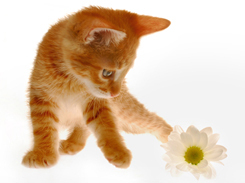 Below are six of the most common behavioral problems in cats and some solutions for them. 1. Clawing your furnishings and carpet. Cats actually need to sharpen their claws, just like rodents need to gnaw. Their claws never stop growing, and what they're actually doing when they sharpen their claws is removing the outer layer of the claw. Some people will simply declaw a cat that is having this problem. I do not advocate this. Even the most indoor of cats may wind up outside by accident or design one day, and if you remove your cat's claws, you're taking away his or her primary form of defense. Before declawing, try getting a scratching post. If your cat loves someone more than anyone else in the family, hang a dirty sock belonging to that person on the scratching post to make it smell familiar (you can take it off after about a day). You can also sprinkle catnip over it or – this is weird but it works – powdered chicken bouillon. The idea is to get the cat to feel friendly enough to the scratching post to attack it. juice over them, wrap them or cover them with aluminum foil (fingernails on the chalkboard, anyone? ), and clean them well to eradicate any cat odor. If you can, close doors to make those places inaccessible to the cat. 2. Eliminating outside the litter box. The first thing to ask is, is it your fault or the cat's fault? Many cats won't use a litter box that is too dirty. They just don't like it. If you think this may be the problem, change out the litter about twice as often as you currently do. You can also be prompt about cleaning any places the cat goes, spraying these areas down well with Lysol or a similar disinfectant with a nice strong smell. You can also try putting the litter box in a more attractive place to the cat; the bathroom, for instance. If it's not in too obnoxious a place, you can put the litter box on top of the place your cat has chosen to go, too, just to make the point. As last resorts, put down bleach, safely, in those spots, and cover the area with aluminum foil. 3. Clawing people. Cats generally do this because they're afraid; again, is it the fault of the cat or of the people around him? If you have a cat that is generically afraid of children, though, you should do something about it; try acclimatization, or exposing the cat to young children until he's calmer about it. Don't let the child loose around the cat. Either have the child sit down in your lap or next to you, feeding Kitty treats. Not all cats are afraid; some are just plain mean to certain people. The only thing you can do about this is remove the cat from the situation; when the cat starts clawing or growling, pick her up and take her to the bathroom until your guest is gone; and it's usually a guest that this happens to, often one who owns pets of his or her own.. If it's a family member, try cat repellant or lemon juice to keep the cat away, then acclimatization to get them used to the other person. If all this fails, you may be forced to have the cat declawed. 4. Caterwauling. Siamese cats do this by nature, and you may not be able to get them to stop. But other cats do it because they are hungry, tired, or sick, or to let you know she has done something good. There aren't many things you can do about this, unfortunately. If you think it's a hunger thing, feed her more promptly, and refuse to feed her when she caterwauls; she won't understand what you're doing, but she'll almost certainly quit after she figures out it does her no good. If she caterwauls because she is in heat, you should get her fixed. For other caterwauling problems, try to ignore her, and keep her as far away from yourself as possible. 5. Spraying. Male cats do this to mark territory, and they usually do it when they feel threatened: when dogs or small children threaten, or when other male cats are around. There is little you can do about this beyond having your cat neutered. Don't punish for it; the cat will not understand at all. 6. Running outside. Cats get very curious about the outside. The first thing you should do is not open the door when the cat can run out. But you can also try to get the cat accustomed to the outdoors by getting a cat leash and walking her on it, or by carrying her in your arms when you go outside. Once she knows what's out there, she's less likely to want to get to it, particularly if you expose her to snow and wet conditions.